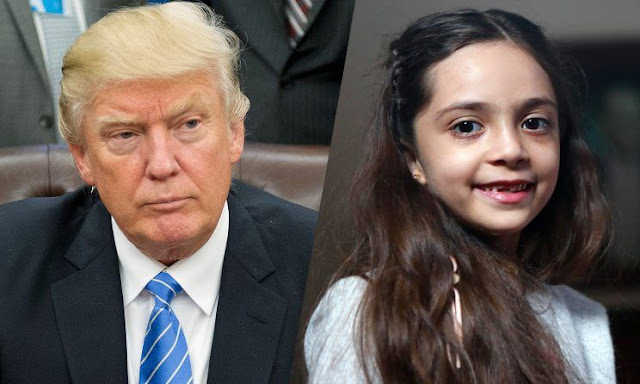 This is WOW News 247: 7-year-old Syrian Girl Writes Trump: Promises to Become Trump's Friend if Trump Helps Syrian Children! 7-year-old Syrian Girl Writes Trump: Promises to Become Trump's Friend if Trump Helps Syrian Children! Bana Alabed, the 7-year-old girl whose tweets about life in Aleppo touched hearts around the world, penned an open letter to President Trump beseeching him to do something to help children still suffering in Syria. The complete handwritten letter, which was written shortly before Trump’s inauguration, opens with Bana introducing herself as a girl who fled eastern Aleppo in December and is now finally enjoying peace in Turkey. She said that her Syrian school has been bombed and that several of her friends had died. “I am very sad about them and wish they were with me because we would play together by (sic) right now. I could not play in Aleppo. It was a city of death,” Bana wrote. Although she now lives in peace and attends a new school, she continued, millions of Syrian children are still suffering throughout Syria and need help. Bana’s mother, Fatemah Alabed, helped her launch and manage the Twitter account while they were still stranded in rebel-controlled eastern Aleppo. They gained hundreds of thousands of followers (362,000 as of Wednesday afternoon) while documenting the horrors of daily life in Syria. Followers would see Bana’s routine as a regular 7-year-old — playing with her siblings, reading “Harry Potter” novels, etc. — repeatedly disrupted by bombardments and chaos of Syria’s civil war. For many, Bana became an international symbol for the toll that modern warfare takes on children, and her tweets were likened to Anne Frank’s diary entries while she was hiding from the Nazis during the Holocaust. Trump has spoken out against the United States relocating more refugees in the United States. He is expected to sign executive orders Wednesday imposing a temporary ban on most refugees, as well as a suspension of visas for people from Syria and several other countries in the Middle East and Africa.